First, reputable rabbit breeders will have lots of bunnies. They’ll keep some of them for their own breeding programs, but they’ll also have some that will make great pets. Second, it’s a great season for acquiring a pet bunny. It’s a great season because it's rabbits' natural breeding season, and they're more than happy to do what they're famous for doing - breed. That's why there are lots of bunnies to choose from around Easter time. Your chances of getting a really great pet rabbit are good. We strongly recommend you get one from a reputable breeder, or from a Pet Shop that purchases from good breeders. Speaking of really great pet rabbits, we heard recently from Michelle, a preschool teacher, who got a pet rabbit for her classroom. "I have a Siamese Satin. She wasn't considered good enough for show, because one ear has a habit of falling sideways, but she's smart as a whip, and sweet as sugar. I got her for my preschool classroom when she was 7 weeks old. We've had her for about 8 months, and she's out of her cage for most of the day, along with the children. She's NEVER nipped, bit or scratched anyone, and sometimes kids can be a bit rough. She's perfect!" I felt very happy. That’s exactly how well-bred, sound rabbits are -- healthy, calm, and delightful. getting sick after they leave momma give me a holler. That is my biggest problem." That’s all Maurice told us initially. But we put together everything we knew about bunny diarrhea, and posted it at Bunny Enterotoxemia. It’s a fairly extensive page. If your rabbits are regularly experiencing 'sticky butts' before, during, or after weaning, then it’s time to evaluate their environment, which should be clean but not sterile, your methods of weaning, which should be as stress-free as possible, and the bunnies’ diets, for any nutritional imbalance (too many carbs and not enough fiber) that could contribute to a bloom of unfriendly disease bacteria. Free feed both pellets and hay. Give a scant handful of BOSS or whole oats per litter, once a day. There seems to be some question 'on the street' as to the connection between weaning age and the incidence of bunny diarrhea. For the record, the risk of bunny diarrhea between the ages of 4 weeks to 9 weeks is elevated, whether or not the bunny is weaned. "I will be weaning our baby rabbit soon at 7 weeks. I have read that a broad spectrum anitibiotic is successful in aiding in weaning. Terramycin is difficult to locate so Oxymycin 10 Soluble powder was suggested. What dosage should I use and for how long. Thank you." My question for Kelli was: Why Antibiotics? "Antibiotics are completely unnecessary, in my opinion. Why kill the friendly and essential gut bacteria your bunny is trying to grow? Instead, give Benebac (probiotic), if you think you need to give something. "During weaning, no people-food, no treats, give lots of hay (either stemmy alfalfa or grass hay), and 16% protein feed. Whole oats or black oil sunflower seeds also recommended, 1 tsp of either, every day. "Your bunny will do great, and by the way, it's probably already 99% weaned by the doe... Have fun!" Find additional information about weaning rabbits and selling bunnies at Baby Rabbits. This page was written in response to an absurd harangue on the Portland Craigslist. I may have to apologize for being a little cranky -- I feel really badly when people bawl other people out for no reason at all. But, I’ll just let you read it for yourself, because I hope it will allay any worries about the rights and wrongs of weaning and selling bunny rabbits. 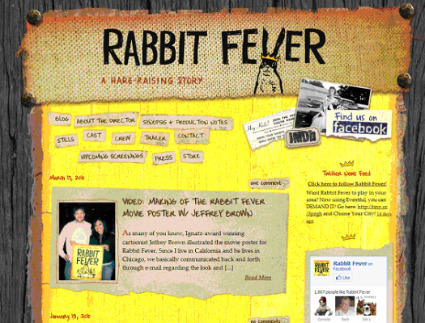 If you get a chance to see the movie, "Rabbit Fever," we recommend it! If follows several youth as they compete to become Rabbit King and Rabbit Queen. You’ll get to see everything about the sport of showing rabbits, and maybe you’ll see why WE are so excited to breed and show our own Rex rabbits. Your friends at Raising-Rabbits.com wish you a wonderful April and a wonderful Easter.